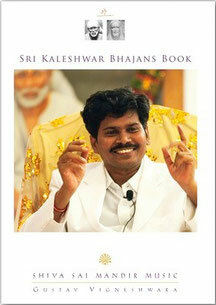 In 2006 Sri Kaleshwar requested Gustav Vigneshwara to write a book of „the principles and how to practice“ the style of Siva Sai Mandir bhajans. He wanted these principles and simple ways of practice avalilable to all his students to study and merge with this knowledge. As far as we know is it the only book that really explains the mechanisms and principles that make bhajans such an unique art of music. Step by step you will be guided in the fascinating depth and abundance of bhajans.